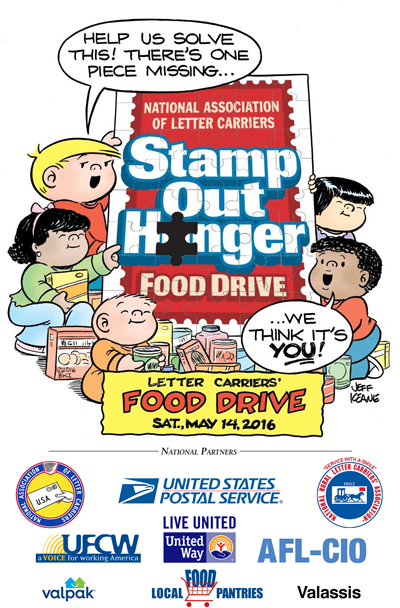 UFCW has signed on as a national partner for the 24th annual Letter Carriers’ Stamp Out Hunger Food Drive, which will take place in 2016 on its traditional second Saturday in May: Saturday, May 14! The partnership between UFCW and letter carriers is a natural one. Working families not only see their letter carrier at least six days a week, they often see their grocery clerk or checker just as frequently. This partnership is perhaps even more appropriate since UFCW represents workers in food-related industries, such as grocery stores and food-processing facilities. The Stamp Out Hunger Food Drive is the largest one-day food drive in the United States. In 2015, active and retired letter carriers, along with their family members and friends—not to mention countless volunteers—collected almost 71 million pounds of non-perishable food. These results brought the grand total to more than 1.4 billion pounds since the drive began in 1992. This Saturday DONATE by placing boxes or cans of non-perishable food in a bag next to your mailbox before your letter carrier delivers mail. The carrier will do the rest. The food is sorted, and delivered to a local food bank or pantry.